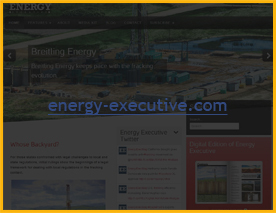 The Eagle Ford shale gas and oil play is located within the Texas Maverick Basin. The play contains a high liquid component. This has led to the definition of three zones: an oil zone, a condensate zone, and a dry gas zone. Petrohawk first discovered the Eagle Ford shale in 2008. The initial well was located in the Hawkville field in LaSalle County, Texas. According to the Railroad Commission of Texas, as of September 2010, there are 162 completed wells in the Eagle Ford as well as 690 well permits. The area for Eagle Ford was calculated using maps and other data reported by the companies who are currently leasing acres with the Eagle Ford shale play. The area of the dry gas zone is estimated at 200 square miles. The same process was done for the oil and condensate zone using the sum of the area for each company. The area of the condensate zone was estimated at 890 square miles and the area for the oil zone is estimated at 2,233 square miles. 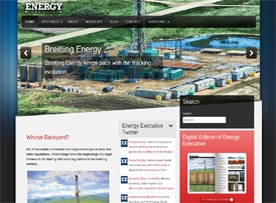 Eagle Ford has an average EUR of 5.0 BCF per well and 300 MBO per well. The shale gas and shale oil play has approximately 20.81 TCF of technically recoverable gas and 3.35 Bbl of technically recoverable oil. According to Talisman Energy and Rosetta Resources, 4 BCF per well was reported as a minimum value for the average EUR, and Petrohawk Energy and Murphy Oil Corporation reported a maximum value of 6 BCF. Additionally, Petrohawk Energy estimated an average EUR range of 150 to 750 MBO per well. The average EUR obtained for the oil zone is 300 MBO, the condensate zone has an average EUR of 4.5 BCF and the dry gas zone has approximately 5.5 BCF EUR. The average well spacing ranges from 4 to 8 wells per square mile, with dry gas zone as the lowest, condensate zone the highest and the oil zone with a well spacing of 5 wells per square mile. The TRR for the oil zone is 3.35 BBO while the dry gas and condensate zones have EURs of 4.4 and 16.4 TCF respectively. The total TRR for the play is 20.8 TCF of gas and 3.35 BBO of liquids. Other average properties were estimated for the Eagle Ford shale play. These estimates are depth (7,000 ft.), thickness (200 ft.), porosity (9%), and total organic content (4.25%). There are more than 11 companies currently holding leases in the Eagle Ford shale play, their combined lease holdings own a total area of 2,125,500 net acres (3,321 square miles). 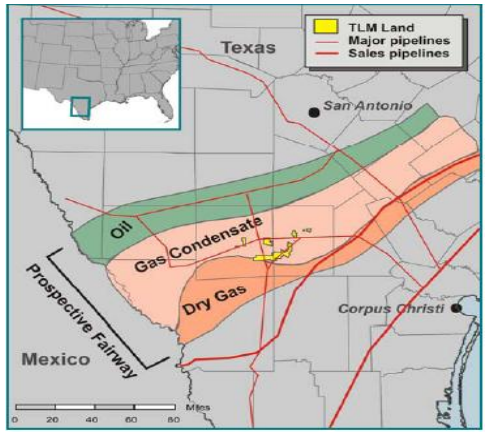 Since Eagle Ford is a developing play, there is minimal information available on the future drilling activity for the companies currently holding leases within the shale. One of the companies to discuss their future development is Pioneer Natural Resources, who plans to increase drilling activity to 6 – 7 rigs in year 2010, 10 rigs by 2011 and by 2012 they plan to be operating 14 rigs in Eagle Ford. According to Petrohawk Energy the average well cost ranges from 4.0 to 6.5 million dollars per horizontal well.